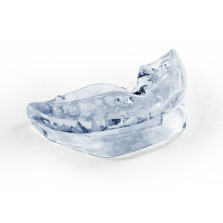 SnorBan® is known in the medical profession as a jaw positioner. These were the subject of medical trials in 2002 along with other anti-snoring devices. The results of these trials were made known at a lecture at the Royal Society of Medicine on 18 Feb 2002 under the heading ‘Treatment Options for Snoring’. The doctors tested nasal strips, sprays, herbal pillows, gargles, etc. but found none of these fulfilled their promise of easing the condition. The only product on the market that was found to alleviate the problem (apart from expensive CPAP machines) were jaw positioners. As a result sleep clinics, dentists, sleep clinicians and doctors specialising in sleep problems were strongly advised to use them. Patients who ask how to solve the condition are now referred to us from many of the NHS sleep clinics.